Opera Night Video Slot Review - Casino Answers! Opera Night is a 5-reel, 20-line video slot developed by Rival Gaming, featuring a wild symbol, multipliers, a drop feature, a free spins feature and a bonus game. You can play the Opera Night video slot at Bovada. Opera Night is a penny slot. Coin sizes on the Opera Night slot machine include $0.01, $0.05, $0.10 and $0.25. You can select up to 20 paylines at 1-10 coins per line. The maximum total bet available on the Opera Night slot game is $50 per spin, which gives is a decent betting range – especially for casual players. 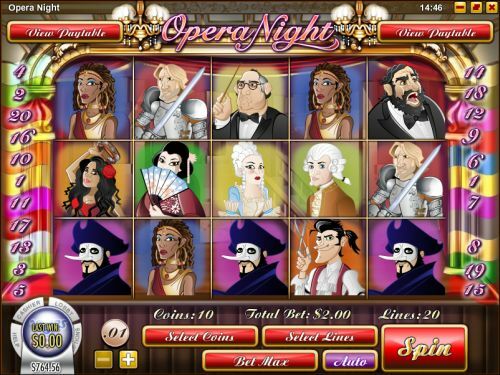 To play the Opera Night casino game, select your bet and hit the “Spin” button or use “Bet Max” to spin the reels with all 20 lines selected at 10 coins per line. The jackpot symbol on the Opera Night online slot game is the Opera Singer symbol. When you hit 5 Opera Singer symbols on a selected payline, you will win the 2000 coin top jackpot. The second highest paying symbol on the Opera Night video slot is the Tailor symbol, which can pay out up to 1000 coins. The Senorita symbol is the wild symbol on the Opera Night slot game. It will replace any other symbol to form a winning line whenever possible. It does not substitute for scatter symbols. Opera Night has an Opera Drop feature. If you land 3 or more Masked Man symbols, you will trigger the drop feature. The Drop symbol will disappear and the symbols above it will fall down to fill the empty spaces. The Conductor is the scatter symbol on the Opera Night video slot. When 3, 4 or 5 Scattered Conductor symbols appear on the reels, you will win 5, 10 or 20 free spins at a 3X multiplier. All of your winnings during the Opera Night free spins feature will be tripled. Try to get tripled winnings when you play the Opera Night slot game at Bovada! Opera Night has an autoplay feature that is available for real money players only. To access it, press the “Auto” button. There are advanced settings available on the Opera Night autoplay mode. You can play from 1-500 autoplay spins, stop when your balance increases/decreases by $1-1000, stop on any win and set a delay between spins of 0-10. You can stop the autoplay mode on the Opera Night video slot at any time by pressing the “Stop” button. For those who don’t have enough cashflow to visit the opera, you don’t need to be wealthy to play the Opera Night casual player slot. The Opera Night video slot is a lot of fun to play and has an original drop feature along with more common video slot features like a bonus game, free spins and much more. You can play the Opera Night video slot when you sign up and make a real money deposit today at Bovada! Are players from the United States able to play Opera Night Slots for real money? Where can I play the Opera Night video slot in my browser? 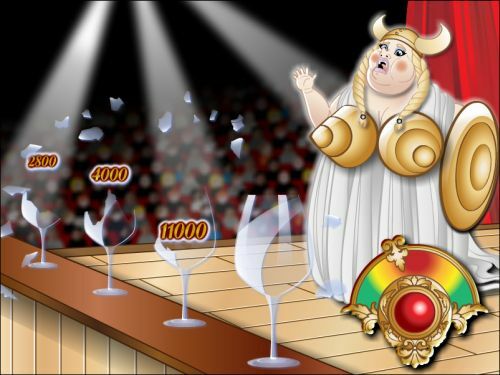 An Opera Night free flash game can be found at Bovada. You can play for free or real money. If you have any issues with the flash casino, make sure to download Adobe Flash Player for best performance.